Mervin was born and raised in Subic Bay Philippines and moved to San Diego at the beginning of 2017. Since he can remember he has been fascinated with not only art but tattoos. At the age of 15, he used his love for making things and began making rotary machines as well as learning more about the craft of tattooing. After his first tattoo at the age of 18, Mervin focused all his energy on becoming a tattoo artist. He used his knowledge of the craft and artistic skills to self teach himself, completing tattoos on friends before working professionally in a shop in 2013. 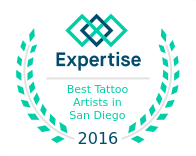 Since he has participated in several tattoo competitions, winning awards in the categories; best tribal, best black grey, and best biotech. In his spare time, he loves night photography and acrylic painting. Mervin is a well-rounded tattoo artist who enjoys doing black and grey realism including portraits, geometric, fine lines, and mandala style tattoos. Tattooing has always been therapeutic and fulfilling to him, he not only gets to use his creative skills but uses his hands to create permanent art on people who trust him to create their masterpieces, this means a lot to him. To schedule a consultation or tattoo appointment with Mervin, please call the shop or use the website contact form and our scheduling manager will get you set up with an appointment.